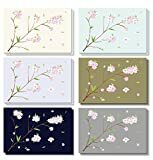 Feature: BULK BOX SET: 120 pack of all-occasion greeting cards featuring 6 Japanese cherry blossom designs, 20 of each. • BULK BOX SET: 120 pack of all-occasion greeting cards featuring 6 Japanese cherry blossom designs, 20 of each. • BLANK ON THE INSIDE: Contains 120 blank cards to include your custom messages for business and personal use. • SUPERIOR QUALITY: Each card is printed on high-quality 250 gsm ivory board paper cardstock for elegance and extra durability. • STOCK UP: Ensure you always have greeting cards on hand for when occasions arise throughout the year. • DIMENSIONS: Each card measures 4 x 6 inches. Includes 120 corresponding white envelopes.